Hvino News | Georgian Wine News: "Decanter" on Georgian wines: "It’s been an eventful five years"
"During this second visit to Georgia, I concentrated on tasting a range of wines from larger companies, those comprising the bulk of the country’s export offer, as well as a range of micro-vinified experimental wines from some of Georgia’s many indigenous varieties made at the country’s viticultural research station at Mtskheta. 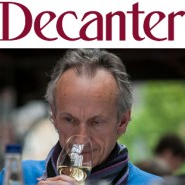 Tasting notes on some of these wines follow next week", - promised Andrew Jefford. The full text is here.